as you never have before! Click to view an up to the minute availability calendar and where you book when the time comes. This makes it easy to view availability for all four bikes when figuring out what date and time works for everyone. Our only goal is to make sure you have as much fun as possible and to make it as stress free as possible on the organizer. Take a few minutes to read the blog entries to learn more about every facet of a pedal tour. Look at the smiles on everyone’s faces, and it will sell you on a pedal tour more than anything we can tell you! Piggy back off some of the great decorating done by prior groups to make your tour even more fun! 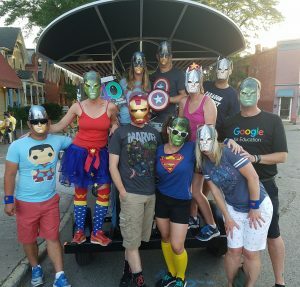 Experience Rochester as you never have before on our pedal powered trolley that takes guests all around Rochester (East End, Park Ave and South Wedge). We go year round and have 4 bikes in our fleet (3-13 seat bikes and 1-15 seat bike). Our tours begin at Marshall Street Bar and Grill at 81 Marshall Street. Down the street at 41 Marshall Street is a municipal parking lot that offers FREE parking for our guests. Bikes can be rented simultaneously for groups of up to 54 people. We suggest booking early because certain time slots are more sought after then others. On our website, we feature an up to the minute booking calendar which will show you all the dates and times you can choose from. Take it all in while you pedal around the city enjoying a beer, wine, cider, sparkling seltzer or mikes hard lemonade type drink (see the FAQ section for full details) The coolest part about being on a pedal tour is all the attention from people walking by, driving bike or pedaling as they wish they were on the pedal tour 🙂 The bike has a bluetooth speaker to play music off of and the organizer picks the route ahead of time when your driver calls you the Monday before your tour to walk you through the day of your tour and to find out what route you want to take. We offer something for everyone: architecture/history tours, progressive dinners (2 restaurants with a different course and cocktail at each one then desert on the bike), brewery tours, team building, retirement parties, and customized bar crawls. Email us at rochesterpedaltours@gmail.com with any questions. Your married friends will wish pedal tours existed when they got married. You pick the route and decorate the bike. 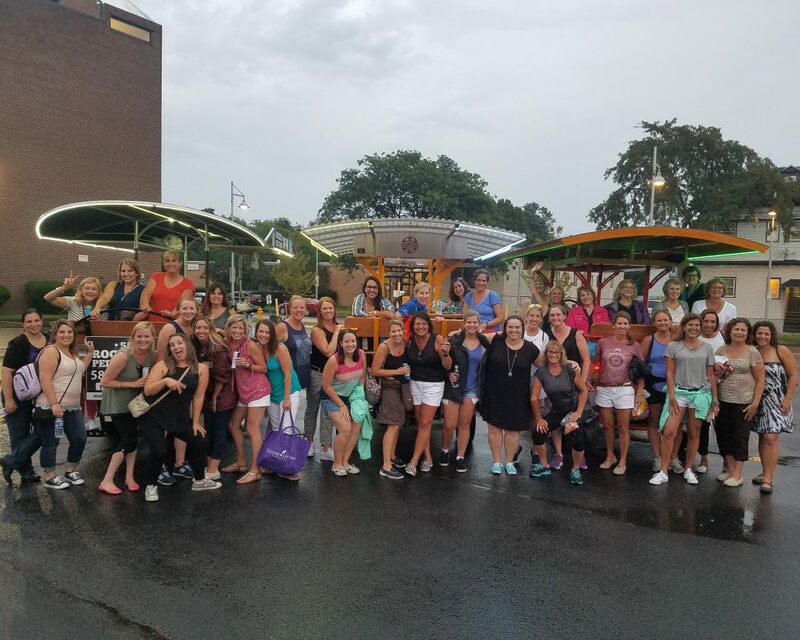 Bring your own beer, wine and food, and we are your tour guide and designated driver as you bar hop around Rochester. This is way more fun than your average architecture tour. Bring your own beer, wine and food, and we will be your guide and driver. Click to learn where our tours visit and for an up to the minute availability calendar. Bring your own beer, wine and food and let us be your tour guide around downtown Rochester and your favorite bars. You pick the route. Click to view availability for all four of our bikes and book here when the time comes.